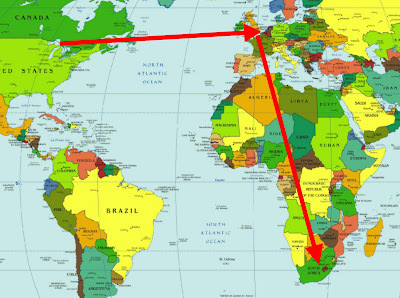 At this very moment Erich is on a flight from London, England to Johannesburg, South Africa! Then he starts a tour of five southern African countries beginning with Victoria Falls in Zambia and ending up back in South Africa. Awesome! Is he going to visit District 9 and shoot some prawns? Wow, you're right......long time in the sky. What an adventurer he is!